Use this tone control Parametric Tone Control 4558 for matched tone setting. Could you repeat that? can occur made to add to offered audio power amplifier? The answer is either decrease load impedance otherwise increase supply voltage.Drop the impedance, the extra current is wanted, making the construction of low impedance output stages another testing (at hand are selected other matter-of-fact limits), so consent to's increase supply voltage. 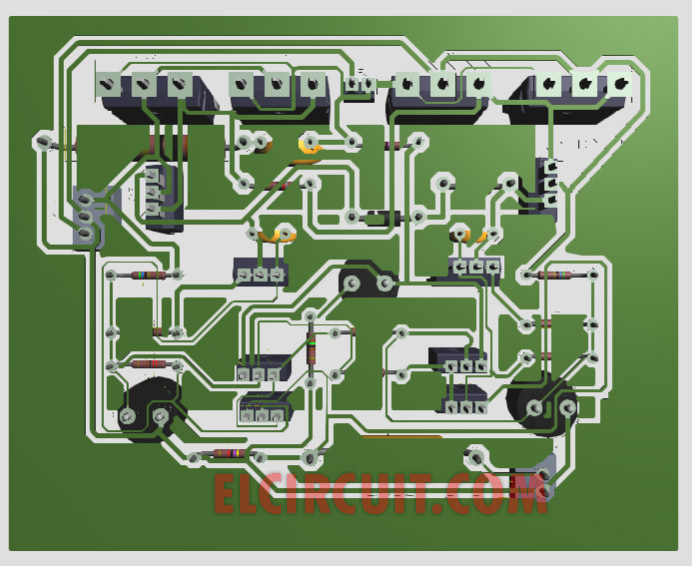 Layout PCB 500W Power Amplifier but you must change the transistor for more powerful output. Very thanks João Batista, if you need information about it, dont hesitate to tell me. Hi! Can you please send me the PCB layout of this? Thank you! I havent received the PCB layout. Please send . Thank you. Hi! Can you please send me the PCB layout of this? I'm new in electron. Thank you! Please check again, also check in bulk or spam folders. Give me your email. I will sent layout design. 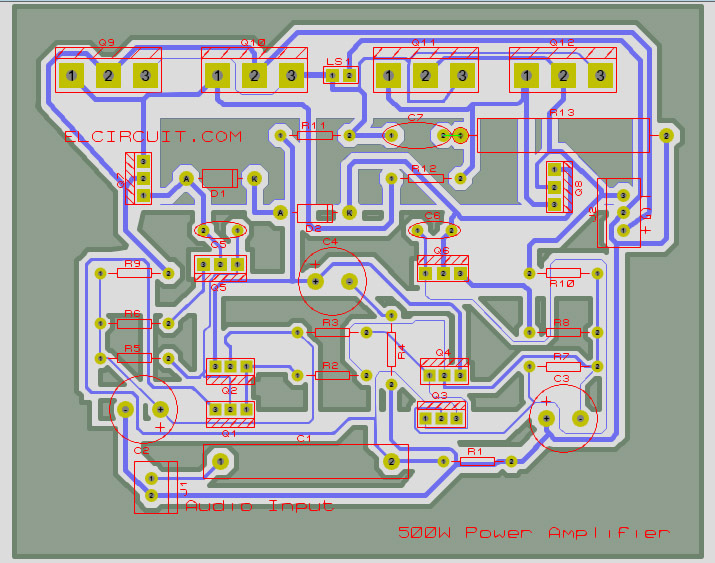 The pcb layout is attached in post. Power supply circuit you can se in this elcircuit site. And tone control that matched for power amplifier use the 4558 parametric tone control. hi can u please mail me pcb layout ? You can see the image of pcb layout in view larger to see it clearly. Thanks for this. 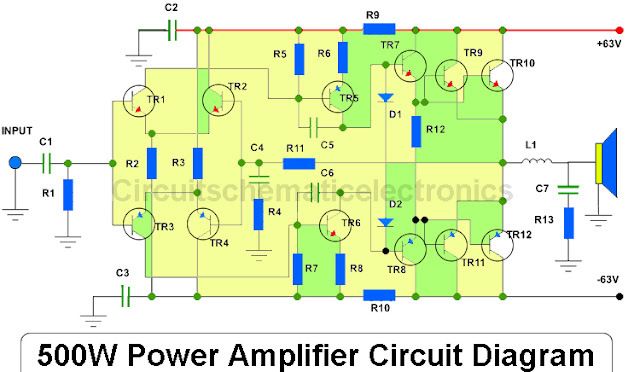 How many amperes is required to power this circuit? Also if I double the circuit to make it stereo, would I need to get a more powerful transformer? Thanks for the prompt reply. If I want to scale this circuit to 1000 watts output, what would I add to the circuit and what would be the transformer rating. Thanks again. 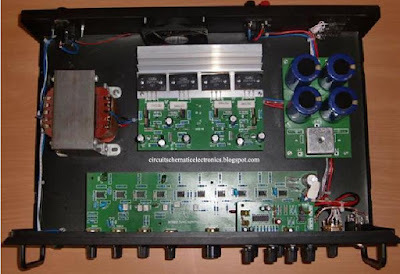 do you need this amplifier to be 2.1 channel ? i will make post about it.. and try to make with videos include inside. Dear Bro... i'm new electronic so Could you give me Power supply & tone control diagram please? 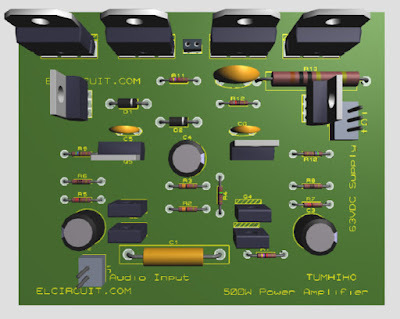 hello visak you can search in here.. the power supply and tone control circuit. Pls send me the schematic diagram and pbc layout thank you denistrembl@gmail.com thanks ! you can see the schematic and pcb at the post above, or you can downliad the pdf file. Doyou can't see it? me too sirs... please send the complete layout of this project including the good power supply and efficient that drives this power amp. 500wx2=1000watts? is this sure sir.. I ask sir. Hey, can you send me a pcb layout? Also maybe some more information about a power supply? 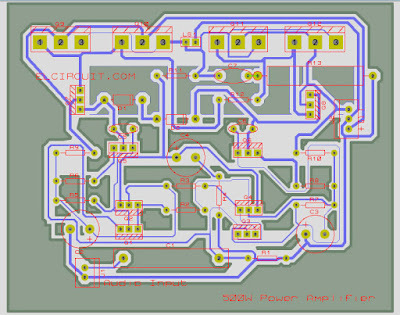 PCB Layout design is just in .jpg image. Hello sir, I believe this schematic is really great that's I am trying to make this, however, I cannot find any D438 transistor. Is there any possible replacement for this? Thanks a lot. This really amazing power amplifier circuit, do you make this one? Thank you very much. Yes I am making this one. Hopefully it will succeed. Thanks a lot. 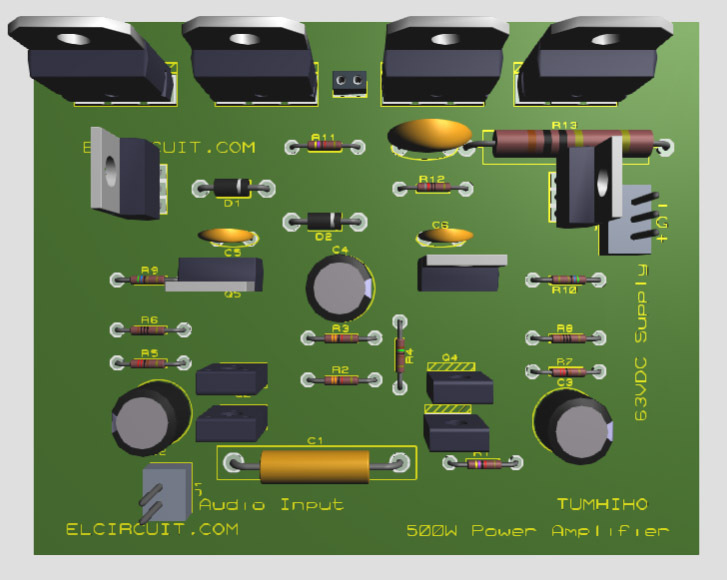 Sir, please send me pcb layout for fully bridged 1500 watt rms. Thank you sir Wahyu Eko Romadhon. I really appreciate it. Your wellcome and good luck for build this amp. you can use the 150W OCL by multiplying it, using BTL modul you can find here. For tone control circuit using parametric tone control for best sound output. i already sent you the pdf file the circuit and pcb layout , please check your email. and its good performance amplifier. 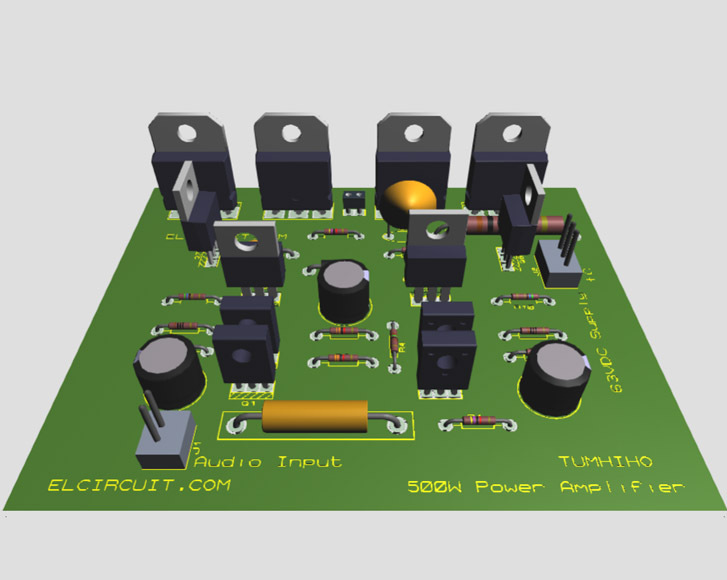 You can download the pcb layout on attachment post image. you can see it on post in pcb layout design parts. Hi! Could you send me the PCB layout of this? Thank you! PCB Layout on post but is not black and white. Yes it can be has output power up to 500W for mono , and stereo 1000W PMPO. Im so sorry for the PCB Layout isnt Black white, i will update for it. thanks. we will sent you an email. Hello yasin, the pcb is attach on post. Okay dear, please check your mail. Hello, im interested with this circuit. Can you send to my email the design on pcb. And also for the power supply ang tone control. Thanks in advance. the pcb design is attach on post sir. Please send me pcb lay out i want to build as my project thank you sir ! Hi! Can we add short circuit and over load protector for this amplifier? And is it posible to configure it in mono bridge output. Please response me on my email add edgarm.colcol@gmail.com. thank you very much! 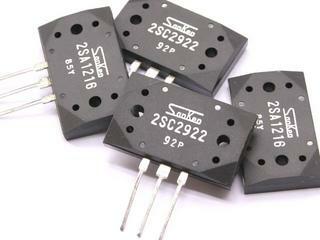 I would highly recomend using some resistance on each of the output transistors emitters to help shairing the current draw between the devices, since they are in parallel. About 0.1 ohms should be sufficent. The diodes providing bias voltage for the output stage should be in close thermal contact with the output devices to prevent thermal runaway, wich would toast the whole amp. Also, why not beefing up the traces around the output devices on the board? If this thing claims to put out some 500W those traces would need to deal with some serious amperage, wich I really doubt those relatively thin traces in the pictures above could handle. What is the thermal resistance of the heatsink used? Design electronic schematics and circuit algorithms using modelling software with high performance virtual desktops with XenDesk cloud solutions. For other dedicated server requirements visit Apps4Rent.com.